Jolida,Black Ice,Fusion, All Jolida Amps on sale, JJ and other brand Tubes also on sale,12AX7, 6L6GC, EL34 and more. We are Your Source for Jolida Fusion or Black Ice Audio equipment, all Jolida models! 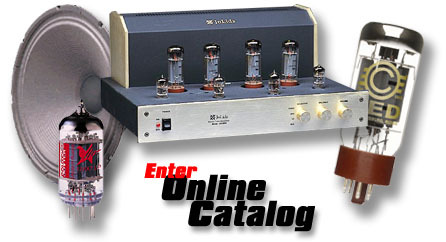 Vacuum tubes,audio and industrial tubes.We carry Jolida and all brands of tubes such as Svetlana JJ,Electro Harmonix and a wide selection of Hard to get tubes If you are shopping for Jolida email us for the best price on any Jolida product. WE sell factory authorized brand new Jolida Fusion and Black Ice Audio US Models with full warranty!!! You get great prices, great service and full warrnty when you buy from us ! We are an authorized Jolida Dealer and have been for over 20 years. Have you checked out the newest models from Jolida Fusion and Black Ice ?? February Special Prices on Jolida and Free shipping to the lower 48 states :Jolida Audio Products only: Order Any Jolida Unit and get free shipping to your door!!! * Plenty of models in stock Click on the Jolida model you want for the Special Price !!! Or EMail for special price. Order Now !!!! Jolida News: Many models are now also available in black faceplate for that extra high tech look. These have been selling as soon as we get them in reserve yours now! NEED TUBES ??? Check out our prices !! !TUBES TUBES TUBES !!! , Electro Harmonix, JJ, Svetlana, TNT, Tungsol, Mullard, Genalex and more !! Tube Sale: 12AX7A/7025 High Gain Chinese branded TNT on Sale !!! We also have the current production JJ(Tesla) 12AX7 tubes. EL34 Svetlana Matched Pairs Matched Quads ! PLus we have many different brands of 12AX7 !!!! Our prices are better than many of the catalog dealers!! WE are tube specialists !!! ANY questions about placing an order or a product ? Please email us at info@newtube.com or Call us anytime,evenings,weekends we will be glad to answer all your questions about tubes, Jolida Audio and all other products we sell. If you get voice mail leave a message!!! Audio Repairs: We dont do them but if you visit our showroom it is shared by SG Custom Sound Audio Repair center on Long Island. Call Scott (718 224 5083) for any info on a wanted repair of any Audio or high end stereo product, Guitar or Bass amps,Effect pedals, PA sound reinforcment amplifiers,CD players,Tuners,Turntables etc. He's the best and has been doing it for over 20 years. Min $250 export orders including Canada*, Domestic minimum order is $25. PRICES: All prices on all products are subject to change without prior notice.We will try to update the prices on the web as promptly as we find out from our suppliers but can not be responsible for price increases from manufacturers who supply us.